I got yet another bag of baby carrots in my Boston Organics delivery last week and suddenly remembered one way (other than carrot cake or carrot cake ice cream) that I've enjoyed carrots: in a curried soup. I don't even remember where I first tried it; I think it was either at Au Bon Pain or in one of the soup cartons from Trader Joe's. I just remembered that I couldn't really taste the carrots, which is exactly what I was looking for. A quick google search gave me Rachael Ray's version as the first hit. It looked simple enough, but I added a few tweaks. I used half an onion and replaced the other half with a shallot since it was all I had. I also halved the amount of butter, added 2 teaspoons of fresh, chopped ginger, and replaced the sour cream with nonfat plain yogurt. Preheat medium pot over medium high heat. Add olive oil, butter, onions, shallots, ginger, and carrots and saute 5 minutes. Add the chicken broth, curry and cayenne, and about 1 teaspoon salt to the pot. Bring to a boil, cover and cook until carrots are very tender, about 15 minutes. Using an immersion blender, carefully puree the soup. 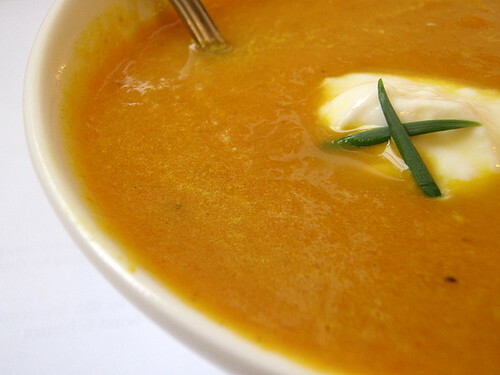 Alternatively, you can use a blender to puree the soup in small batches. Ladle into bowls and top with a heaping spoonful of yogurt (or sour cream) and scallions. 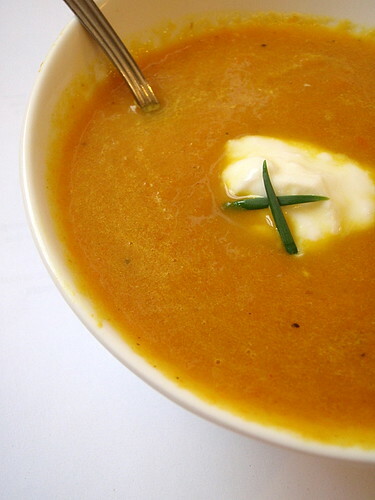 If you don't have yogurt or sour cream, you can also add a swirl of cream into the soup to balance out the spices, but you'll lose the tanginess of the yogurt. yum. i've made a lot of soups that look like this, made with roasted peppers, sweet potatoes, winter squash, etc., but never with carrots. I Love looking at your blog! Everything always looks so good. What kind of camera do you use? Please come back and post more recipes!!! This is my favorite food blog for a reason!! !